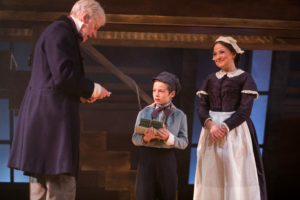 A new version of Oliver, with a festive Twist, opened at Hull Truck on 30th November. I took my son and my mum along last night to watch the show and we had a fantastic evening. 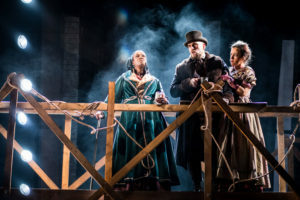 I love going to Hull Truck; the theatre is very family friendly, they always put on excellent productions and you feel really close to the stage and action. Taking my eldest child to their Christmas show has become festive tradition in our household. We started with Treasure Island two years ago, last year we went to A Christmas Carol and when I heard that this year was going to be Oliver Twist I keen to carry on the tradition. 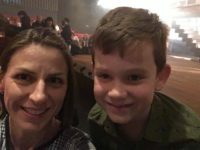 It’s my sons birthday this week (he turns 8) so we went for an after school birthday treat to the 7pm performance. Walking into the auditorium we were greeted with a fabulous stage set, this years scene is set both on the stage floor and up several staircases to an elevated section. The cast were excellent as always, very talented actors and singers with great costumes. They each play several parts and the way the story flows and comes together is very clever. The story was gripping, my son was clutching onto me at times as he got so into the plot, and the whole performance was very entertaining. My mum said it was one of the best shows she’s seen and my son said he’d really enjoyed it. I had a lovely evening out with my family and I can’t wait to go back to Hull Truck again (I’m taking my youngest to their Ugly Duckling Christmas Special later this month!). The show is recommended for age 7+ and I would say that my son at almost 8 was a perfect age to watch it. Some of the scenes are very atmospheric and not suitable for young children but this is a perfect show to watch with older children, ideal as an alternative to panto and also a great introduction to Dickens. You can find all ticket information on their website here. Hull Truck Theatre are delighted to present their new collaboration with playwright Deborah McAndrew. 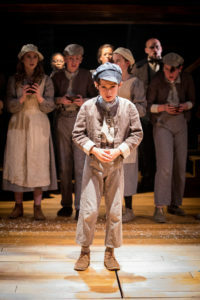 Directed by Hull Truck Theatre’s Artistic Director Mark Babych, Oliver Twist is a cheerful celebration of Christmas that combines traditional carols, folk songs and original music. The production’s talented cast includes Flo Wilson, Claire Storey, Oghenekevwe Emefe, Lauryn Redding, Ian Jervis, Patrick Bridgman, and Samuel Edward-Cook. The professional company will be joined by two teams of young talents drawn from our Youth Theatre and the Northern Academy of Performing Arts. Ticket prices range from £10 to £26. To book tickets for Oliver Twist click here or call the Box Office on 01482 323638.